This site is primarily a server for webcams monitoring possum nesting boxes in a suburban backyard in Brisbane, Australia. 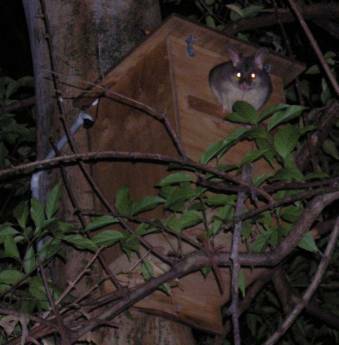 There are currently six (working) box cameras being monitored - five possum boxes and one sugar glider box. From this site you can view these cameras live, as well as download movies which were automatically recorded whenever motion was detected in a possum box. There is also a Blog and YouTube Channel associated with this site. Be sure to check them out if you like cute possums. Possums are nocturnal animals. A possum will normally enter their nest box an hour or so before dawn and leave it fairly soon after dusk. These times, however, vary considerably according to the individual possum and the weather conditions—some like to sleep in, especially when it's cold and wet. Sometimes a possum will visit a nestbox briefly during the night, but your best chance of seeing one is during daylight hours. For the benefit of overseas and interstate visitors, the local time is shown below. Possums are very irregular in their habits. They don't always go back to the same box every night, but alternate between sleeping places on a random basis. On one occasion there were five possums sleeping in the boxes simultaneously (two possums, a mother and baby, were sharing one box), at other times all boxes have been unused for weeks at a time. Possums are equally likely to use boxes at any time of year, however things are often more interesting in the hotter months; there are more likely to be babies about and possums tend to lie about in cute poses (e.g. on their backs with their legs in the air), rather than curl up into tight uninteresting balls to conserve heat. This site has a limited bandwidth uplink. Originally, it didn't provide full streaming video at all, and was limited to an old-fashioned webcam interface with a snapshot of the possum box which updates every couple of seconds. This has now been changed and streaming video is available. However, if the network load gets too high the streaming may stop, or get slow and jumpy. If this happens, you should switch to a slower update rate via the radio buttons on the bottom of the screen. Unless things are really bad, you shouldn't have to go any slower than a 2 second update rate. Also see the Possum TV Blog and YouTube Channel.